Yamagata Koubou use a birch wood for the ken and cherry for the ball, Keyaki kendamas on the other hand are made from a different type of wood. It is the Japanese Keyaki wood, which comes from Zelkowa Serrata tree. Keyaki wood is commonly used in Japan for production of handmade trays, vases and other things. Used trees are 15-20 years old, which means lower dampness and higher durability of the wood. Keyaji is the hardest wood ever used for manufacturing kendamas by Yamagata Koubou, thus this kendama has its own typical sound when played. Also, it is more resistive to wearing off and the pike gets into the hole easily. Keyaki kendamas weight is about 135 g and are 17 cm high. 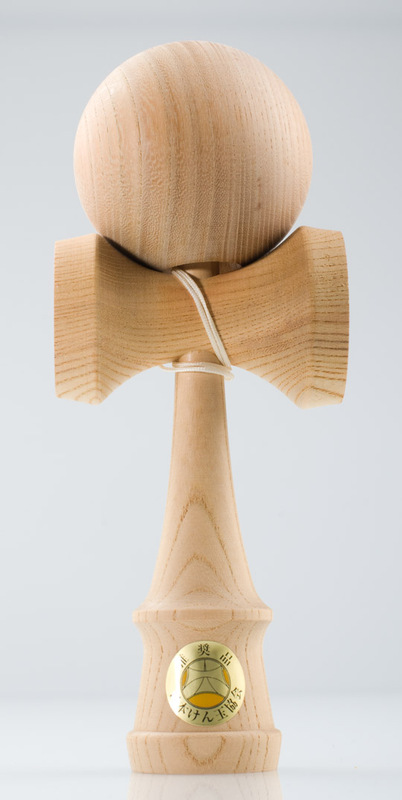 Unlike the photos we have JKA approved version of this kendama in store.